Rising fashion and art scenes are casting a new light on California’s glamorous city. I’ve spent most of my adult life living in New York City and San Francisco—two places where the locals seem particularly prone to rolling their eyes at Los Angeles. So I’ve gotten used to justifying my unabashed affection for the city to those around me. As a regular visitor over the last decade or so—chronicling L.A.’s art world ascendance and, more recently, writing about the city’s booming market for glass-walled trophy mansions as a West Coast writer for The Wall Street Journal—I’ve found there’s a lot to love, such as the canals, the fresh produce, the stiltlike palm trees set against bright orange sunsets, and Japantown’s Tokyo-grade ramen. L.A. seems to unveil itself to outsiders a little less obviously than do other cities; its biggest charms often feel a bit more hidden. It’s so sprawling and populous that it takes a while to untangle it. There are pop-up art galleries in strip malls, cool new restaurants buried behind giant parking lots or tucked behind office buildings, roof-deck film screenings, and East Side neighborhoods where up-and-coming designers work out of their garages. Lately, though, I’m finding I no longer have to make the hard sell. It seems L.A. is winning over even the crankiest New Yorkers and smug San Franciscans, and I couldn’t be happier about it. Along with the real estate market, the city’s arts and cultural scenes have blossomed onto the world stage. One of many recent watershed moments was the opening of billionaire art collectors Eli and Edythe Broads’ $140 million Diller Scofidio + Renfro-designed Broad Museum. The stunning space highlights their hit- filled contemporary collection of works by Koons, Basquiat, Murakami, and so many others. Just as exciting are the smaller galleries highlighting both lesser-known artists and bigger names, which seem to crop up or expand weekly. The city’s urban landscape has also transformed. On the West Side, a $1.5 billion, 6.6-mile extension of the city’s Metro Expo Line now connects Santa Monica with downtown L.A. by train for the first time since the demise of streetcars, in the ’50s. Downtown L.A., which has had fits and starts of residential development over the years, finally seems to be taking off, with apartments and condos rising in once-forgotten neighborhoods. Ride-sharing services such as Uber and Lyft, especially in Downtown, have made the nuisance of having to drive everywhere a nonissue. Of course, many of L.A.’s more annoying clichés prove true. You will walk past aspiring actors and reality stars taking selfies in front of murals that feel designed expressly for Instagram. Navigating the traffic remains a conversational constant. And you may find yourself ordering a dish or beverage named after an emotionally affirmative statement or a cringe-worthy pun (“I Am Gracious” or the “Green Latifah”). Mostly, though, there’s a sense of don’t- take-it-all-so-seriously experimentation and an excitement for the new that make L.A. feel like a place where fun is a priority. Life and work seem intertwined, as is typical in a company town. And of course, the year-round sunshine doesn’t hurt. Many of the city’s latest openings are adaptive-reuse projects. Built in 1927, during the golden era of L.A. architecture, the 300-room Hollywood Roosevelt was the original location of the Academy Awards. Recently, the tower rooms received a $25 million upgrade courtesy of Yabu Pushelberg; next, the 62 bungalows will be reimagined into a members-only swim club. One thing that won’t change: the iconic work of art by David Hockney lining the pool. 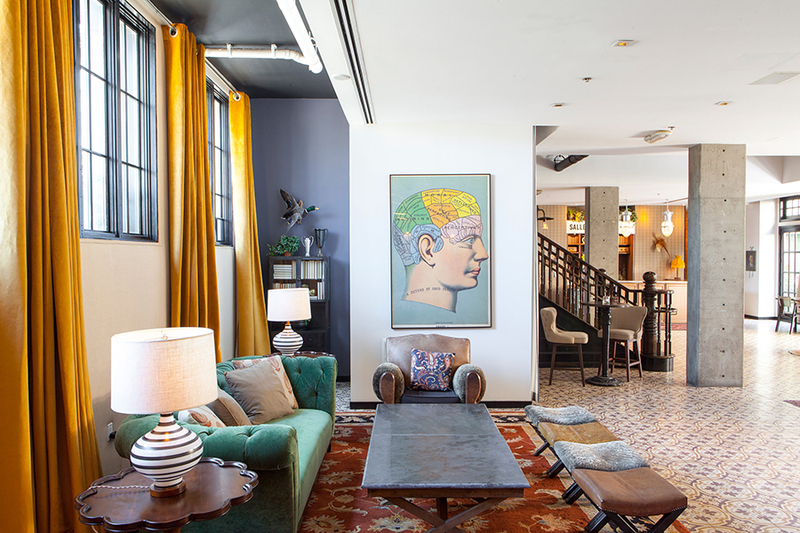 Hotelier Avi Brosh’s long-stay Palihouse West Hollywood is a more discreet bolt-hole, with 37 studios and loft-style accommodations. A boho spirit pervades the communal spaces thanks to Moorish- patterned floors and vintage rugs, and plush, brightly hued furniture. The essence of ’50s-era Palm Springs permeates the 84-room Avalon Hotel in Beverly Hills—once a popular hangout for Marilyn Monroe—which was given a refresh by interior designer Kelly Wearstler. The arrival of the bistro Viviane, off the pool fringed by colorful brick-walled cabanas, has activated a newfound culinary buzz. Grab a seat on one of the custom settees or the iron-forged stools fronting the bar and order one of chef Michael Hung’s Continental staples. Meanwhile, Downtown’s hotel arms race continues. 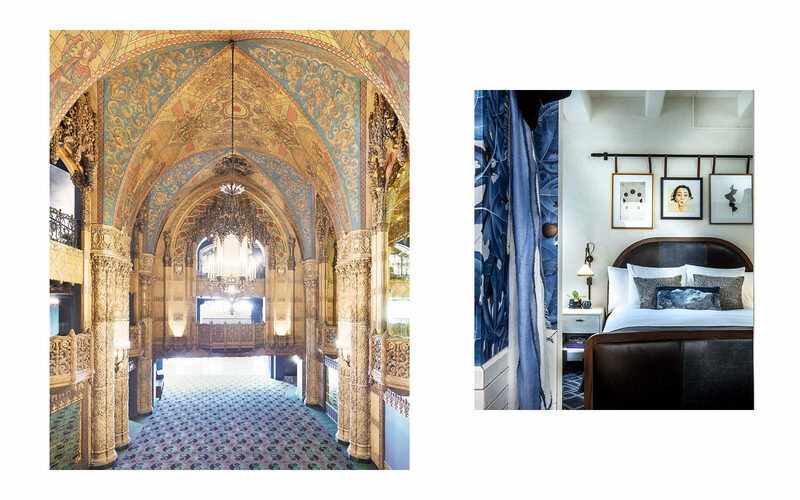 When Commune Design was retrofitting the historic United Artists building as the Ace Hotel, they discovered a poured-concrete core behind the tower’s Spanish Gothic exterior. The spare look remains; the 160 rooms, inspired by architect Rudolf Schindler’s home in West Hollywood, are outfitted with gray-toned fiberboard furniture and matte brass fixtures in the bathrooms. 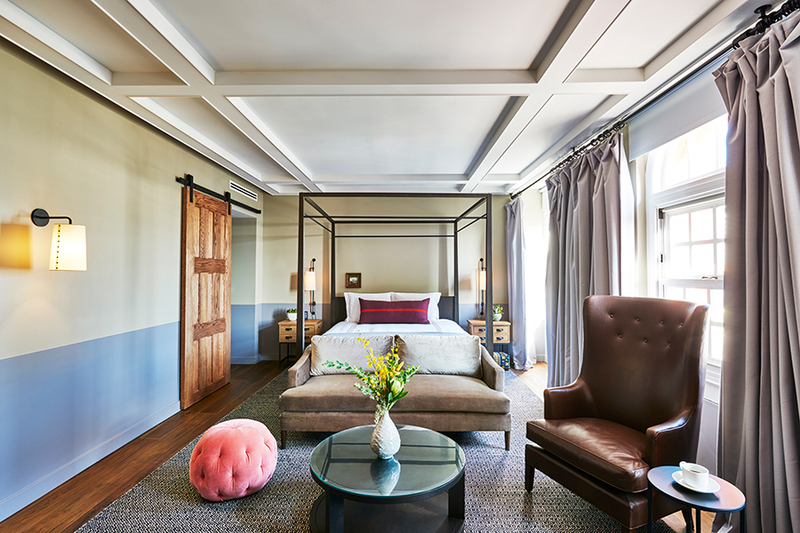 Hotel Figueroa is reopening this spring after a comprehensive restoration of the property’s original 1920s Spanish Colonial design. Originally an exclusive women’s hostel, art will be at the core of its ethos, with a program curated by Seulgi Oh, formerly of Chateau Marmont. Expect original artworks and vibrant tropical-print wallpaper in the 285 rooms, and a restaurant that celebrates Basque Country cuisine. The third outpost of Sydell Group’s elevated hostel concept, Freehand, might be the most grown-up version yet. Roman & Williams reskinned the Commercial Exchange Building, with 167 private rooms, compared to 59 that are shared. The James Beard-nominated Broken Shaker bar returns, taking over the roof, while the one-off Rudolph’s in the lobby offers innovative tea-infused cocktails and rare spirits. Another Sydell project, the Line Hotel, was the first to plant its flag in Koreatown, taking inspiration from its 1964 building, designed by Mann Johnson + Mendenhall, and from the neighborhood’s 24/7 culture. The list of collaborators reads like a roster of hometown cult figures: street food master Roy Choi, nightlife impresario brothers Mark and Jonnie Houston, garden and interior designer Sean Knibb, and lifestyle brand Poketo. The Knibb-designed rooms are notable for concrete-style wallpaper and floor-to-ceiling windows looking out to the Hollywood hills. 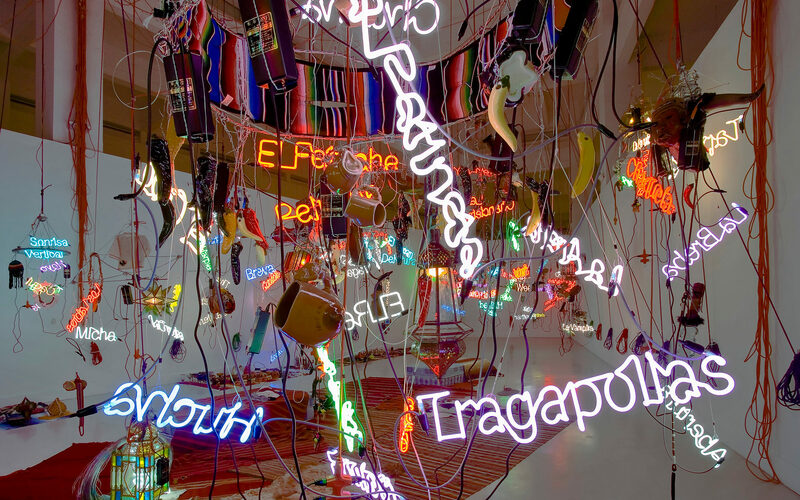 One of the biggest developments in recent years has been the city’s emergence in the art world as a rival to New York. Lines still wrap around the block for entry to the Broad, which offers free general admission. 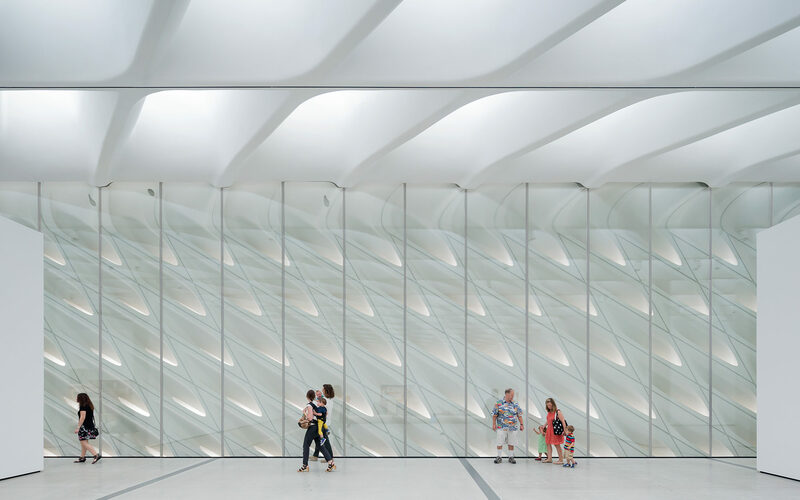 The building’s honeycomb exterior, by Diller Scofidio + Renfro, lets in filtered daylight; inside, an escalator leads through a womblike entrance of undulating gray fiberglass walls. The crowd-pleasing contemporary collection includes works by Barbara Kruger, Jenny Holzer, and Kara Walker, among many others. The Napa Valley-inspired restaurant Otium is a stand-alone box with a rustic interior by Osvaldo Maiozzi, with chef Timothy Hollingsworth in the kitchen. The Museum of Contemporary Art and its satellite gallery, the Geffen Contemporary, are conveniently located within walking distance. 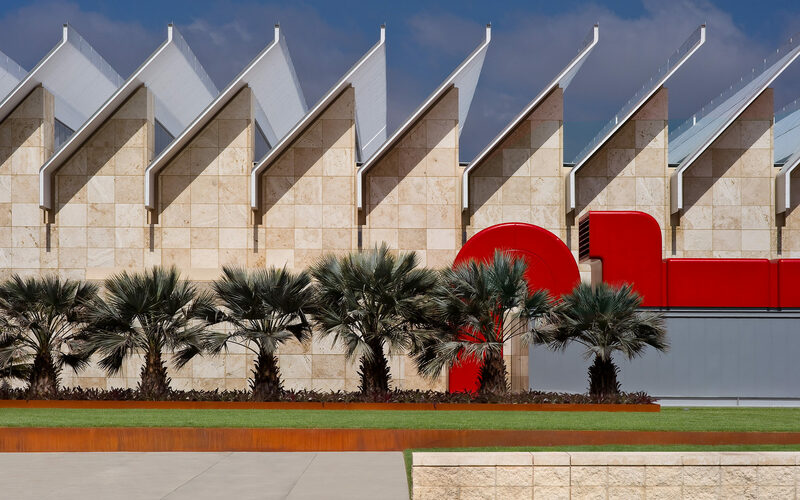 MOCA has a nearly 7,000-work collection and upcoming shows at the Arata Isozaki- designed Grand Avenue location, such as the first-ever retrospective of painter Kerry James Marshall, a Civil Rights-era African American artist. Another newcomer is Hauser Wirth & Schimmel, the latest offshoot of the Zurich-based gallery. Teaming up with MOCA’s longtime chief curator, Paul Schimmel, it took over a former flour mill in Downtown’s Arts District, and includes a public garden. Close by, Night Gallery, named for its original hours of 10 p.m. to 2 a.m., when it was located in a Lincoln Heights strip mall, now operates out of a large warehouse with standard hours. Drop by François Ghebaly’s artist cooperative next door, where the Frenchman’s exhibition space shares real estate with two art-house publishing companies and a residency program called Fahrenheit. Farther west, in Mid-Wilshire, the Los Angeles County Museum of Art is set for a $600 million redesign of four buildings by architect Peter Zumthor in 2018. The permanent collection of 130,000 objects—which range from pre-Colombian masterpieces to edgy contemporary art—recently added the popular “Rain Room,” an immersive and selfie-generating sound-and-light installation by Hannes Koch and Florian Ortkrass, of the London art collective Random International. Culver City’s Blum & Poe is known for pushing the envelope and giving controversial artists their first gallery shows, from Takashi Murakami to Kanye West. One of L.A.’s most beloved arts institutions is the Hammer Museum, adjacent to UCLA’s campus in Westwood. It recently announced a major expansion headed by longtime architectural partner Michael Maltzan to roll out by 2020. For nearly three decades, West Hollywood’s Regen Projects has functioned as a platform for experimental artists, often hosting debut solo shows and influencing the contemporary-art conversation with provocative exhibitions. Despite the old chestnut that Angelinos seem to be constantly on a diet, in recent years L.A. has joined the conversation as one of the country’s best food cities. Destroyer, a breakfast-and-lunch-only restaurant tucked away in Culver City, has a workshop vibe that reflects the style of the creatives who work in the surrounding industrial spaces. 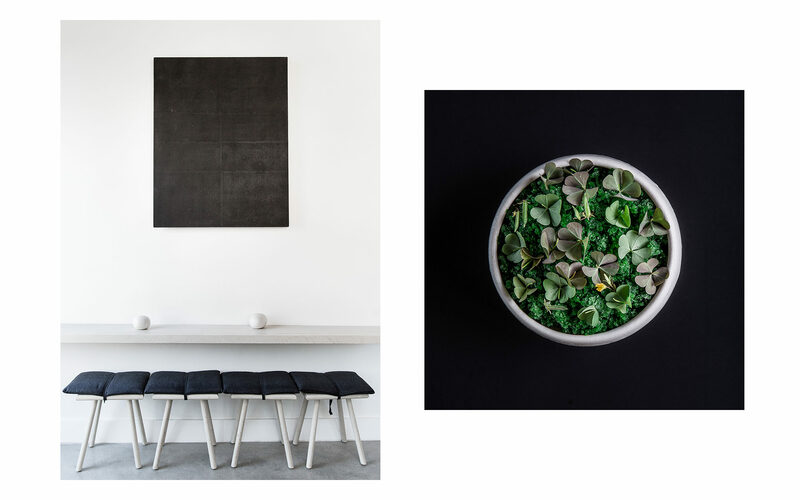 The starkly minimalist aesthetic—concrete floors, exposed truss-beam ceilings, white walls—sets the stage for Chef Jordan Kahn’s visual presentation. Brightened by a skylight, the restaurant serves dishes such as beef tartare with smoked egg cream and pickled mushroom radish, prepared with black silicone whisks and spoons, to keep even the sound to a minimum. Hollywood’s Gwen, designed by Brooklyn-based Home Studios, is chef Curtis Stone’s follow-up to the heralded Maude in Beverly Hills. Patrons enter the space through an old-fashioned butcher shop that leads into a dining room that nods to the building’s 1920s origins. A pink marble-topped bar, glass-enclosed fire pit, and one-of-a-kind furnishings by Coop provide the setting for the five-course degustation menu of Argentine asado. On the ground floor of Santa Monica’s 1937 art deco landmark Telephone Building, the brasserie-style Cassia is helmed by chef Bryant Ng, who turns out fire-grilled renditions of Asian recipes, from Kabocha Squash and Chinese broccoli to pork-belly vermicelli. Local firm Montalba Architects is behind the raw interiors of Calacatta marble surfaces and bleached-walnut furniture. On the opposite end of the spectrum, 71 Above is named for its location in the Financial District’s rounded U.S. Bank Tower. L.A.’s Tag Front oversaw the design of the wraparound dining room, outfitted in 3-D hexagonal ceilings by Arktura and tint-adjusting glass panes with views that stretch all the way to the Pacific Ocean. Entrées are seasonal—try the wild striped bass with cauliflower, harissa, raisins, pine nuts, and preserved lemon. One of the biggest stories in recent years has been the rise of the East Side, as an influx of young settlers from the slash generation have flooded in looking for cheaper rents. The most obvious example might be Silver Lake, where Kettle Black sits a couple of doors down from its sister restaurant, Sawyer. The soaring former bank vault on Sunset Boulevard exudes a modern-rustic feel: double-tall ceilings, custom hex tiles, and a 20-foot-long living wall hanging above the banquettes. At happy hour, a crowd packs the ceiling-high brass bar for cocktails and meatball sandwiches. Along the L.A. River, in Frogtown, Salazar sits inside the bones of a disused auto garage and serves Sonoran-style Mexican barbecue. The bulk of the colorful seating is outdoors, in a desert-like landscape designed by the Yard, featuring planted cacti, fire pits, and a pergola left over from its past life. 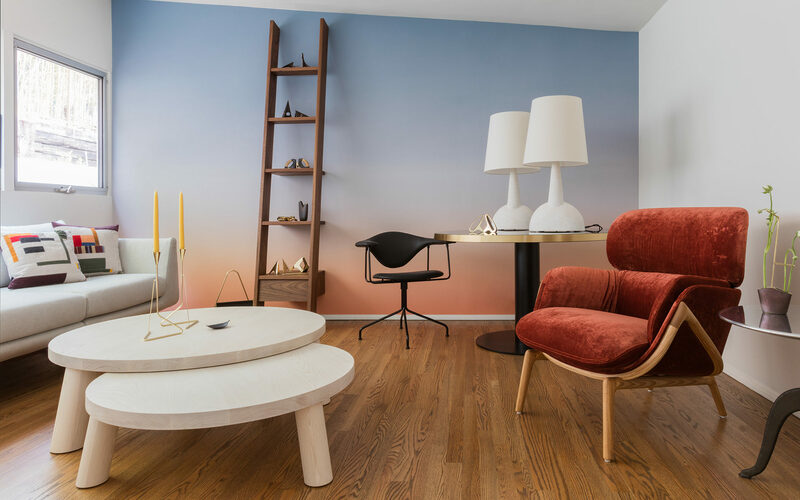 Echo Park’s Winsome pays homage to the Elysian building’s midcentury architecture, originally conceived by William Pereira, the architect behind San Francisco’s Transamerica Building. 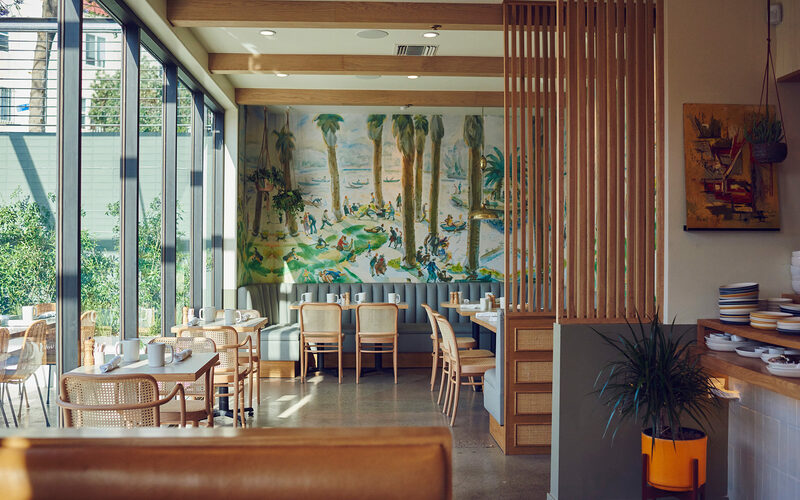 L.A.-based Wendy Haworth Design washed the interiors in blond wood, natural light, and a mural print of the 1938 watercolor painting “Sunshine in Echo Park.” This place excels at brunch, the highlight being duck’s-egg toast. Highland Park Bowl is one of the most interesting nightlife concepts to come in a long time. Masterfully restored by 1933 Group, the Prohibition-era structure, with its Spanish Revival facade, was once a pharmacy where patrons imbibed medicinal whiskey, a punk rock club, and eventually a bowling alley. Chesterfield sofas are positioned next to eight restored lanes; pinsetters have been refashioned into chandeliers; and vintage ball-returns now serve as liquor shelves at the horseshoe-shaped bar, where old-fashioneds and Moscow mules flow through the taps. Fashion has long flourished in L.A., particularly from a manufacturing and celebrity standpoint, but these days it’s evolving from casual Cali brands to high-concept labels, as European and American designers—Tom Ford, Rachel Comey, Dior—decamp for the West Coast to present new collections, eschewing New York and Paris Fashion Weeks. Designed by architect Elizabeth Roberts with interiors by Charles de Lisle, Comey’s first L.A. shop opened last year on Melrose with wraparound rattan window seats, and terra-cotta-colored floors. The minimalist, somewhat earthy setting displays her ready-to-wear collection and cult-favorite shoes. Next door is where Mary-Kate and Ashley Olsen opened the first brick-and-mortar store for their fashion label, The Row. Inside the modernist bungalow, complete with a sleek courtyard pool, racks filled with the sisters’ collection are set up in rooms staged with hand-picked furnishings from local vendors. Expanding on the residential retail model is Casa Perfect, design-and-art brand the Future Perfect’s new outpost in the West Hollywood Hills. Trips to the Midcentury home by Korean American architect David Hyun are appointment-only; what patrons will find is a selection of Hamburg House bedding, designer Christian Woo’s outdoor furniture, stoneware by ceramist Eric Roinestad, and more. It also doubles as founder David Alhadeff’s pied-à-terre for visiting members of the creative community. Meanwhile, in Downtown’s South Park, The Well captures the current zeitgeist of multiuse concepts. During the day, the revived warehouse functions as an on-trend salon and boutique, peddling underground merch and labels such as Rick Owens; after dark, the salon turns into a bar and a 200-person venue hosts pop-up art parties and DJ sets.